In May 1922, the “catholic Circle” of Rio takes up a 63 years old idea, which consisted in building a figure of Christ on a hill overhanging the city and the bay of Rio. Among several proposals for a “monument with Christ the Redeemer”, the association adopts the project of da Silva Costa: a Christ holding a cross with the left hand and carrying a large sphere in the right hand. The monument would rest on a decorated trapezoidal base of small ionic columns. But this project of “Christ to the balloon!”, drawn by Oswald at the request of da Silva Costa (who cannot draw), is scoffed by the public and the avant-gardes. The idea is given up, but da Silva remains the deputy building owner of the project of the future monument. Commissioned by the archbishop, he will recruit the artists and technicians to conceive and carry out a new project. In 1923, da Silva Costa, goes to France to find the sculptor able to carry out similar prowess. He meets successively Bourdelle and Landowski. The meeting with the latter is decisive. Landowski understands the expectations of the archbishop by looking at Oswald’s drawings. One of them represents a Christ with the wide arms. Landowski is delighted by the idea and agrees to start from this symbolic concept of a Christ confounded with his own cross, under the condition that the entire freedom of aesthetic creation remains his. Da Silva Costa accepts and commissioned Landowski. Landowski creates many successive drafts. Little by little, the sculptor frees himself from the initial drawing and brings in his own ideas: the tunic with small folds retained by a cord, drawn by Oswald, becomes a “saie” (a kind of tunic) with transverse folds. The global proportions are revised: Landowski gets back to Leonardo da Vinci’s drawings, where the head corresponds to a ninth of the body. Ten years later, Landowski comments on the problem of the proportions which he solved for his Christ: “The taller a statue is, the more [it] is necessary to reduce the head. The proportion of 7 heads ½ fits for the natural size, but it must be 8 for two a meters high representation, 9 for two meters fifty, and my Christ of Rio counts at least 12 heads. Otherwise the figure appears short ». Lastly, he transforms the mineral base drawn by Oswald into a decorated quadrilateral chamfer decorated with a frieze featuring scenes of Jesus’ life. Continuing his research, Landowski creates a second draft of 40 centimeters, exposed today in the museum of the Thirties in Boulogne-Billancourt. The clothing is radically transformed: it is now a majestic and stylized drape, with large flat pleats in style “art deco”. It reminds of the Holy Genevieve’s drape – on the bridge of the Quai de la Tournelle in Paris. A specimen of this statue was given to the Pope John Paul II by Marcel and Françoise, the sculptor’s son and daughter. Heitor da Silva Costa, who often comes to see Landowski, accepts this proposal. Paul Landowski wished to carve the whole monument in real size in his atelier, but that was not possible because of the transport. Landowski thus only carved the head and the hands in real size. For the body, he created a 4 meters high sculpture that would be extended on location, in reinforced concrete. The specialist and pioneer Albert Caquot drew the plans for the sculpture’s enlargement and conceived all the internal structure. Delegated by Landowski, Albert Caquot accompanied the existing pieces and the model by boat (the head and hands dismounted in cubes and the body intended to be increased). On the Corcovado mount, Caquot supervised the unpacking of the installation. The author of one of the most famous sculpture in the world, Landowski never saw it with his own eyes. Held back by other orders, such as the mausoleum of Sun Yat Sen in Nankin (China), he could not make the several months travel to Brazil. The final Christ is such as he wished it, except for the frieze that he had conceived for the base and which was eventually removed. 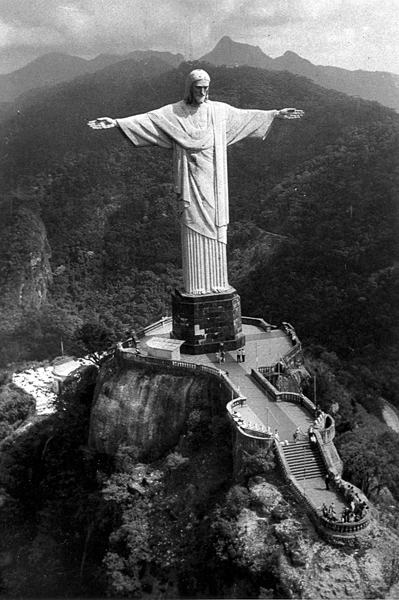 A Carioca Christ, who opens his arms to the whole world! Resulting from the French-Brazilian friendship, the Christ became the symbol of a city, and even of a nation. Carioca women cut out the small pieces of steatite which cover Christ. Heitor da Silva Costa never regretted choosing Landowski for this work: Paul Landowski, membro de instituto de França, condecorado coma legião de honra, laureado em varios concursos e autor de trabalhos notaveis que o colocam no primeiro plano da geração contemporanea, trabalhou com o mior carinho e o melhor espiritu de colaboração. Póde agora, o eximio artista, orgulhar-se de seu talento na contemplação de sua obra ».